The word ‘Lithosphere’ is formed by combining Greek words ‘lithos’ which means rock and ‘sphaira’ which means sphere. Lithosphere can be defined as the solid outer section of our planet, Earth. It includes the earth’s crust and the upper part of the upper mantle. It extends from the surface of the earth to an approximate depth of 80-100 km. Our planet is made up of various layers. The outermost layer is known as the earth’s crust. Beneath the crust, there is a solid and rigid layer of rock material that is known as upper part of the upper mantle. It is made up of tectonic plates. It can be classified as the continental lithosphere and the oceanic lithosphere. The average thickness of the continental plate is about 22 miles and of oceanic plate is 6-9 miles. A mathematician, A.E.H. Love described the earth’s structure for the very first time in 1911. Main plates of the lithosphere are: – the Antarctic Plate, the African Plate, the North-American Plate, the South American Plate, the Eurasian Plate, the Indo-Australian Plate and the Pacific Plate. Some other plates are: – the Caribbean Plate, Indian Plate, the Cocos Plate, the Arabian Plate, the Nazca Plate, the Juan de Fuca Plate, the Scotia Plate and the Philippine Sea Plate. These plates are comparatively smaller. We extract various natural resources from this solid outer section of our planet. Temperature below the lithosphere can reach up to 1000°C. This high temperature allows the rock material to flow. When continental plate and oceanic plate meet, the continental plate overrides the oceanic plate as the oceanic plate is denser. Declan, Tobin. " Lithosphere Fun Facts for Kids ." Easy Science for Kids, Apr 2019. Web. 21 Apr 2019. 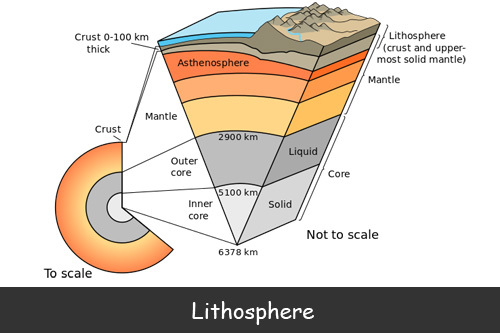 < https://easyscienceforkids.com/all-about-lithosphere/ >.